Nettie Herskovitz was wealthy and widowed. Her suitor, Harry Diamond, was a dashing young bootlegger a decade and a half her junior. At first she resisted his advances, but soon the two were married with an infant daughter. Disinterested in a domestic life, Diamond shot Nettie on Valentine's Day 1923 while riding in their Hudson sedan. He tried to pin the crime on the fleeing chauffeur, but Diamond made a mistake. Though mortally wounded, Nettie lived long enough to identify her attacker to police and change her will. The sensational Diamond murder became tabloid fodder—a Roaring Twenties story of roadhouse floozies, illegal booze, orphaned children, trust funds and legal acrobatics. Jane Simon Ammeson is a writer specializing in history. Her work has appeared in national and international magazines and she has written numerous local history books, including Holiday World, Miller Beach and Brown County, published by Arcadia Publishing. 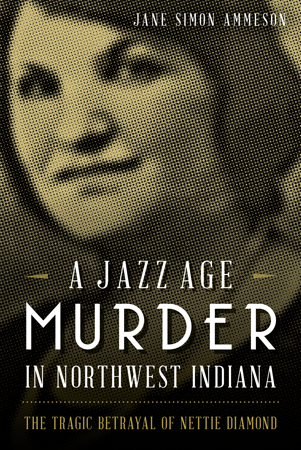 She was born and raised in Indiana Harbor and became interested in the story of Nettie and Harry Diamond when she learned that many of the people she knew when growing up had connections to this quintessential Jazz Age story.